This makes a 6" block! CLICK HERE for the 6" paper Piecing Pattern! or CLICK HERE for a 12" version! The first thing that I would recommend that you do, is go to the Practice Paper Piecing Page. When you feel comfy with paper piecing, come on back and make a Spider Web! You will need to print out four copies of the template page per block you want to make on very lightweight paper. A Fat Quarter of each fabric should be plenty! 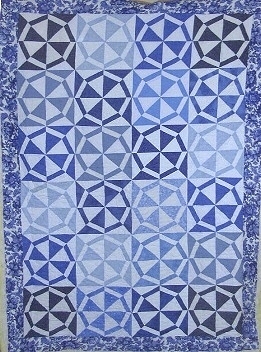 After you have pieced all 8 triangles, sew them together to complete your block! Here are a couple that Valerie Made! The Quilting Angel's!